The other day I stopped by my friend Britanie’s house to borrow a book and she also sent me home with some beautiful pomegranates that she got from Bountiful Baskets. (Those of you in the Boise area, my friend is also the coordinator for a new pick-up location right here! I believe it begins mid November in Meridian.) I thought this would be the perfect time to take some pictures and do a quick tutorial. Pomegranates show up in stores right about now, and I know a lot of people who don’t buy them because they have no idea what to do with them. If that’s you, then I challenge you to pick one up next time you’re at the store and just eat it for fun! I love introducing fun, seasonal foods like this to my kids. The fact that it’s a “superfood” is a bonus. My boys had never tried a pomegranate before and they loved it. 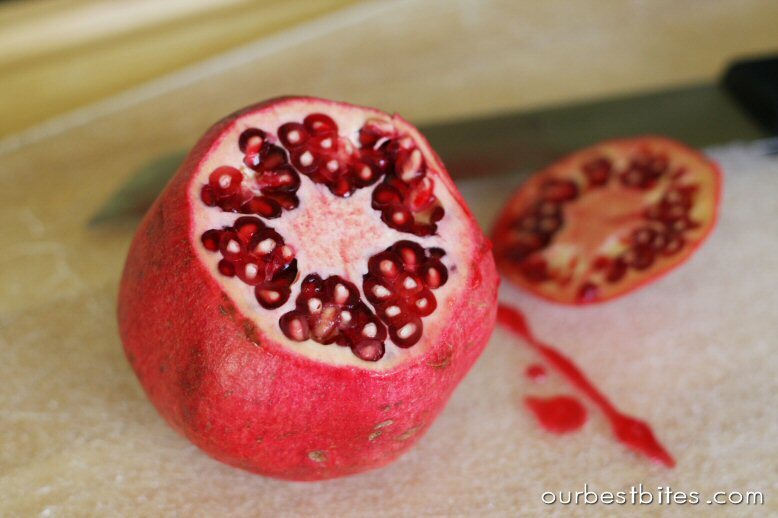 If you’ve never tried one, basically you break it open and pull out the little seeds (called arils) that are surrounded in a translucent, ruby colored coating that bursts with juice when you eat it. If you don’t like straight up pomegranate juice (like me) then know that the fruit itself is sweeter. Now you can just cut the thing in half and have at it, but you might end up with bright red juice all over you. 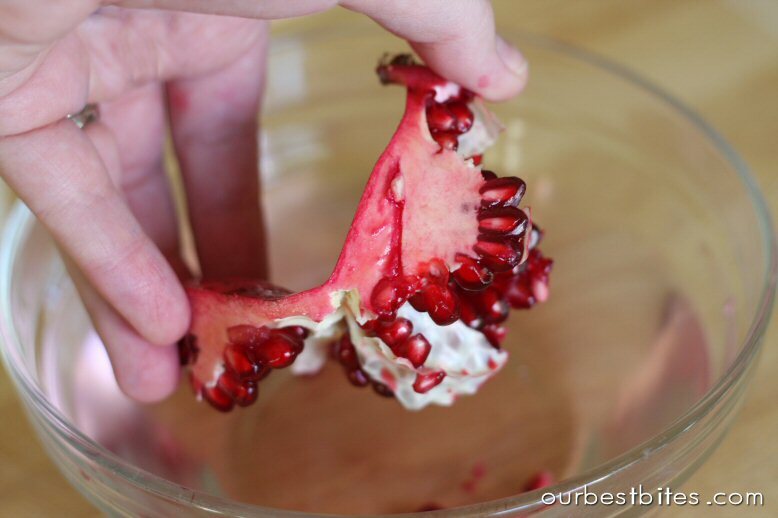 Here’s some easy steps to what I’ve found to be the easiest and cleanest way to handle a pomegranate. Using those segments as your guideline, just score the outer skin of the pomegranate, from top to bottom. You don’t want or need to cut all the way through the fruit, just the skin. Now you can easily break the segments apart with your fingers. Since you didn’t cut all the way through the fruit, all of the arils should be in tact and it shouldn’t be too messy. Aren’t those gorgeous? The fleshy arils will easily come out with your fingers. Just bend back the skin and pull them out with your hands. Or as many mentioned in the comments you can just whack the back with a wooden spoon and they fall out easily as well. I like to use the water method. Fill a medium sized bowl with water and remove the seeds right over the bowl- or even under the water. The seeds will fall to the bottom and any white parts will float to the top. Any juice that comes out will go straight in the water and wash off. Remove any white pith that is floating in the water and discard. Pour the remaining contents of the bowl into a strainer over the sink. Give them a quick rinse with cold water and they’re all ready to eat! Plain, with my fingers. But you can also think of them as sprinkles of sorts! They’re delicious sprinkled into salads, especially in place of recipes that use dried cranberries. Try them in this Candied Walnut Salad, or this Summer Strawberry Salad, or this Sweet and Salty Salad Wrap. They also work great sprinkled on top of desserts. Try sprinkling on top of your whipped cream over pumpkin or apple pie, or even on ice cream! 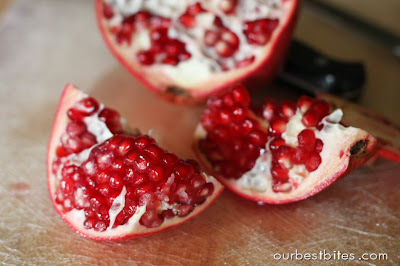 Since Pomegranates are so trendy right now you can find tons of recipes on the internet for both sweet and savory dishes. 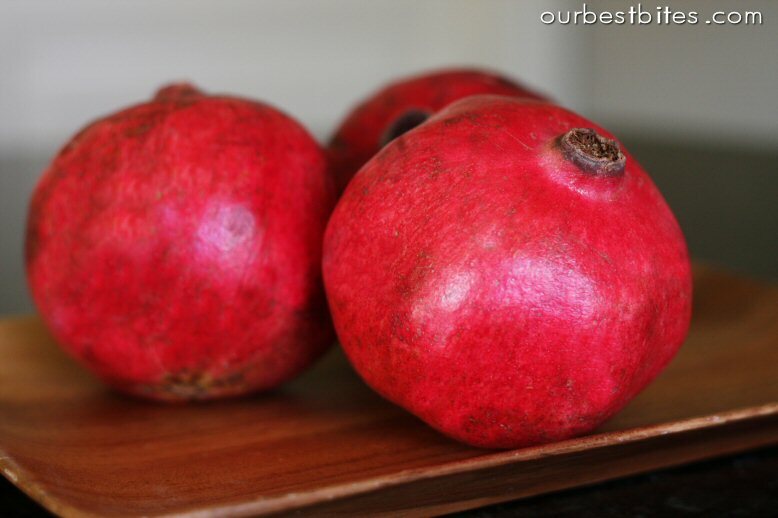 How Top Pick a Ripe Pomegranate: Unlike fruits such as bananas and mangoes that are picked when unripened, pomegranates aren’t picked until they’re ripe and ready to eat, so technically if it’s in the store, it should be ripe. That being said, sometimes you get ones that are better than others. Definitely feel for weight, a heavier fruit means the more juice inside. Also avoid any fruits that are shriveled, bruised, or have super soft spots. Freezer Instructions: Lay arils in a single layer on a flat plate or baking sheet. Place in freezer 1-2 hours. When completely frozen, place in freezer safe container or zip top bag. Frozen seeds are especially great added to smoothies for an icy nutrient boost! Cut the fresh pomegranate in half as you would a grapefruit. 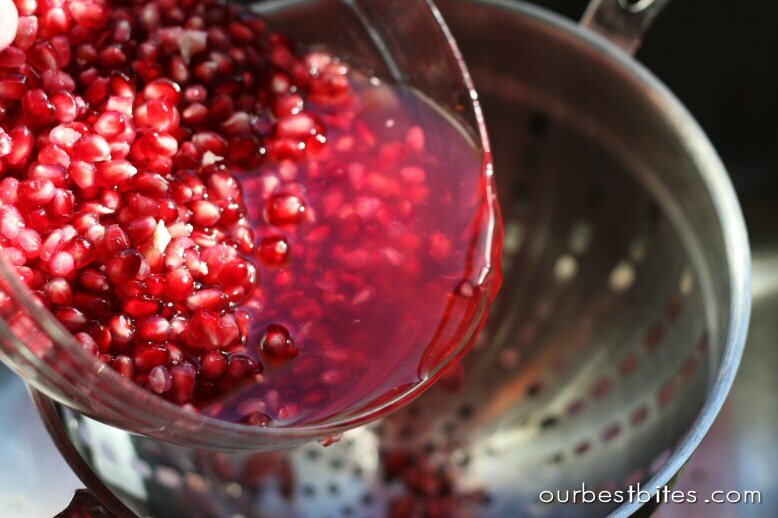 We recommend using a hand-press juicer to juice a pomegranate. If you use an electric juicer, take care not to juice the membrane, so that the juice remains sweet. Strain the juice through a cheesecloth-lined strainer or sieve. Caution, pomegranate juice stains. Place 1-1/2 to 2 cups seeds in a blender; blend until liquefied. Pour through a cheesecloth-lined strainer or sieve. Caution, pomegranate juice stains. 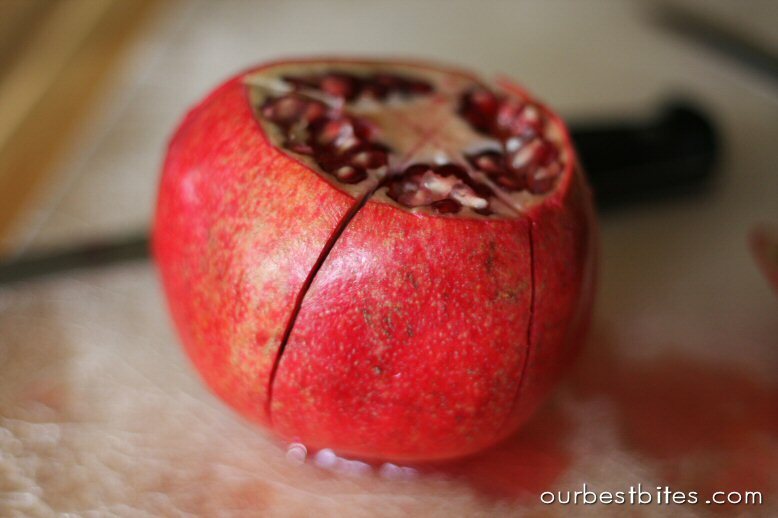 On a hard surface, press the palm of your hand against a pomegranate and gently roll to break all of the seeds inside (crackling stops when all seeds have broken open). Pierce the rind and squeeze out juice or poke in a straw and press to release juice. Caution, pomegranate juice stains. NOTE: Rolling can be done inside a plastic bag to contain juice that leaks through the skin. Nutrition Information: Pomegranates are loaded with nutrients and are a great source of fiber! What do you guys do with Pomegranates? And if you’re looking for some Halloween fun this weekend, check out this great post on Easy Halloween Party Food! How do you tell if one is ripe? I tried one years ago and the seeds were hard and crunchy. I like adding it to a fruit pizza! I just posted on FB about peeling these being a full-time job for 5 kids! ha! I just learned they sell them pre-peeled at local grocery stores! Yippppeeeee! I made the BEST salsa last year with minced cranberries, pomegranate, minced orange and jalapeno. I'm making it for Halloween but going to add some mango too. Eat it w/crackers and cream cheese. We are lucky down here in southern utah and have home grown pomegranates. They are so much sweeter than the store bought ones which are a different variety. Our outer skins are more yellow with some red running through them. How we tell they are ripe is the skin starts cracking itself if the outer shell does part easily they aren't as ripe, we can just tear the skin with our fingers. I love pomegranate season and my 2 year old forages around grandpas farm just finding them and eating them she loves them so much!! Great tutorial. Sandy- great question, I just added that info to the post! Charity- pre peeled?? How interesting! Angela- that sounds SO good! Susie- you lucky duck. I'm jealous you get to grow your own. How fun! …. and cilantro and lime, almost forgot! I just bought a pomegranate the other day. I was wondering if I was going to be in the mood to fight eating it, lol (aka, getting all the seeds out to enjoy). I'm glad you posted this. I love to just eat them all by themselves. 🙂 They are a good addition to a salad though. Christmas breakfast isn't complete without crepes and fluted kiwi halves sprinkled with arils. The green and red make a pretty Christmas treat. I've even skipped the scoring step(just cut in half and pound with a wooden spoon) and it works like a charm! This is a great method, because I find the little white pieces that stick to the seeds annoying to pick off. I'll try this. I usually cut it into section and beat the back of the pomegranite with a wooden spoon. They just fall out… but I'll try your method out! I just tried it recently, but didn't like the small hard seeds inside the arils so I'd pop them in my mouth and spit out the seeds. THANK YOU!! I have NEVER known how to eat one, what part was even for eating! I could never find this information. Those ruby red, juicy arils are one of life's great pleasures! 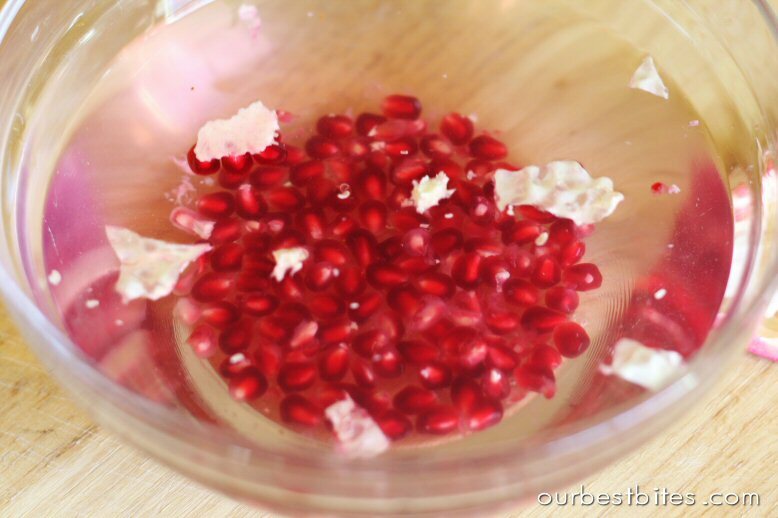 Another way to extract the seeds is to hold a pomegranate half in your hand, skin side up, and whack the skin with a wooden spoon. The arils fall out like magic. 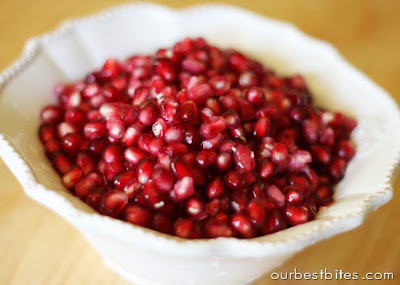 I love to make a cranberry pomegranate salad every Christmas. It is so yummy and has sugar soaked cranberries with pomegranates, grapes, pineapple, walnuts, and whipped cream. I love making Alton Brown's pomegranate jello recipe. Great article, I love this site! Seems like I am the only male here though. But I don't mind! I love the writing style and the recipes a lot! Keep up the good work! I love pomegranates but I have a question. If you eat it straight from the skin, do you eat the hard part of the seed? For instance you have the juicy red outside and then white middle part. Can you eat that white middle part? the BEST thing to do with a pomegranate is to make a pomegranate cheesecake. I made a bunch last year with rave reviews and have been waiting for them to appear in the store again so i can make one again. I LOVE Bountiful Baskets! The pomegrantes were tempting, but what to do with that many with limited time at the moment. If they have these around Christmas though, perhaps they could be used as neighbor gifts! 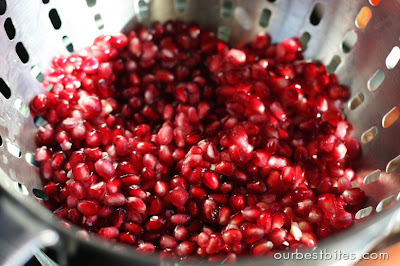 At thanksgiving..we make a pomegranate salad. It has apples and pomegranates and pecans in a whip cream base…it's delic. It might be a S.Utah thing though since we grown pomegranates so well down here. I have 3 beautiful pomegranates in my kitchen right now and got a little messy opening up the last one. I was about to go searching for a way to do it with less mess and your post came up just at the right time. Thanks! Pomegranate fruit salad – bananas, pomegranates, walnuts, can of fruit cocktail (not something I EVER use but for this salad) and then mix with fresh whipped cream. sooo good! I also use it as a replacement for grapes in chicken salad. They are the best to bite into. It's funny to see these becoming so popular all of a sudden. My family has been eating and loving these for as long as I can remember. Now my kids are enjoying them with too! We mostly peel and eat them plain but we also love to stir them up in our oatmeal at breakfast. Last year I tried a pomegranate guacamole for the first time. I was uneasy but tried it and it was awesome. I tried making it myself based on recipes I could find through google. Try it with some chips or crackers. Yum!! Thanks so much! I got some pomegranates in my Bountiful Basket and I was putting off opening them. Ow I know how! This comes at a perfect time, since I just bought 25lbs of pomegranate from the co-op. Have you tried any of the juicing methods? I'm wondering which way is the best. My tweener and her cousin could have used this a week or so ago. Let's just say that the kitchen looked like a CSI crime scene by the time they were done hacking up 3 pomegranates! 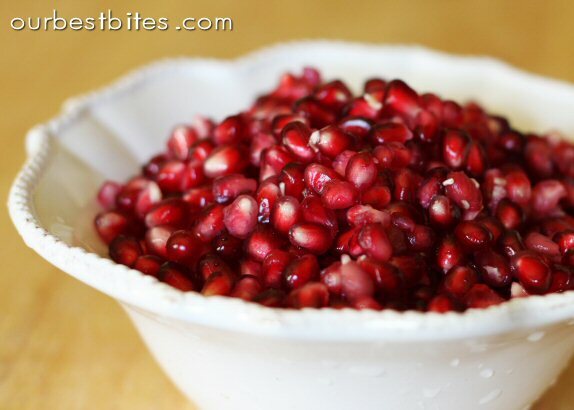 really enjoy baking with pomegranate seeds. They're a spectacular addition to really fudgy brownies, or to muffins (pistachio & pomegranate is great). The seeds don't burst when they bake and do keep lots of flavor. Microwaving the baked goods later is not recommended, as they turn to mush. My mother cuts pomegranates right in a bowl of water! My favorite is putting a 1/3 cup on top of homemade granola. Yummo and so healthy, too. I just got a pomegranate at the store today. I was so excited to try this method out. It was perfect! I will be buying many more this season! Thanks so much. Wow, thanks! I ate these as a kid a bunch, but it was a long process with little payoff. This was so easy! A friend of mine has a relative with a whole orchard of pomegranate trees so she brought a bagfull back from Cali. Just used your method, and less than 5 minutes later I'm thoroughly enjoying my pomegranate, thanks! Want a delicious and simple fruit salad? One pomegranate, 2-3 apples (red delicious compliment the pomegranate the best), heavy whipping cream. Whip the cream, cut the apples into small bite size pieces, prepare the pomegranate. Mix all three together for deliciousness. I grew up with tons of pomegranate trees in my yard. There are two types, sweets and sours. Sours are dark red inside and out we squeeze and make pomegranate jelly….YUMMY! The sweets have a lighter skin as well as seed, we use them for our own version of pomegranate salad. We mix sliced bannanas, pinapple and pomegranates, some people add apples and nuts too, then we thicken the pinapple juice and mix it with dream whip once cooled. Fold fruit into the dream whip/pinapple mix. Be prepared, this is very addicting! Ya have to love pomegranate season! Pingback: Thanksgivukkah. | Brussels sprout pesto kugel with lamb, cranberries and pomegranate. | The Eighty-Three Thousand | I like food. I hope you do, too. not usually comment, but wanted to share the simplicity. Thanks for getting me started. And those of you who have easy access to the poms…you are lucky.